The latest PCI compliance standards require that any site accepting credit card payments uses TLS 1.2 after June 30, 2018. Transport Layer Security (TLS) is the protocol that allows digital devices, such as computers and tablets, to communicate over the internet securely without the transmission being vulnerable to an outside audience. The credit card gateway that connects to our registration software is moving towards requiring support of TLS 1.2 earlier than the June 30 deadline, so most likely it will happen sometime in May. At that time, registrations completed online will require customers to run their registrations and payments through an internet browser that supports TLS 1.2. If action is not taken by the customer to enable this new security protocol, credit card transactions WILL FAIL and registration will not be complete. Please follow the steps provided in the TLS 1.2 Document to ensure a smooth transition. We will keep everyone apprised of the proposed date for the switch. Thank you! In March of 2017, Scarborough Community Services went through a major upgrade to our registration system. While not much has changed for online registration, one key difference is how the shopping cart functions online. We have received many calls from households stating that nothing happens when they click to add an item to the shopping cart. One of the requirements with the new registration system is needing to enable pop-ups in order to proceed with an online purchase. As shown to the right, the new shopping cart will appear at the bottom of your screen and allow you add it to your cart then proceed to checkout. There might also be limitations with this new requirement and trying to complete registrations on a mobile device, such as a smartphone or a tablet. If you have enabled pop-ups and the error persists, please give us a call at 730-4150 so we can figure out a solution. 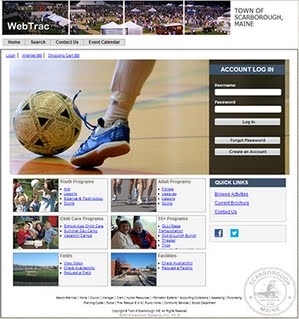 Scarborough Community Services uses WebTrac, an online application available 24 hours per day, 7 days per week, to process program registrations and payments. Click the link below to launch WebTrac! If you do not remember your user name and password, or need to set up a new household in our system, please contact us at 730-4150 Monday through Friday 8:00 am to 4:00 pm. Passwords are case-sensitive. Most passwords are last names so please be sure to enter an initial cap (i.e., Brown). If you haven't registered online in over six months, you must review your household information before registering for any activities. You may access a calendar for all of your family's activities. This can be accessed under Household Calendar.